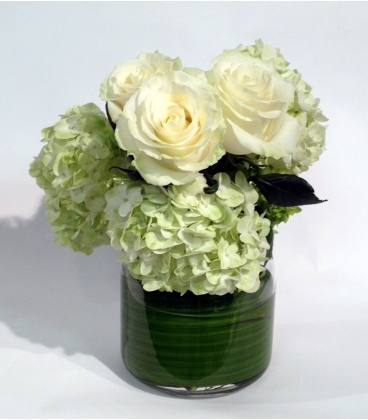 Floral arrangement with roses from Equador and green hydrangeas. The vase is included in this modern designed arrangement. I sent these as a thank-you and was very pleased. The recipient sent a photo and the arrangement looked exactly as it did in the photo, if not fuller. I find I'm often disappointed by the photo v. actual delivery and chose this florist based on all of the wonderful reviews. They did not disappoint!